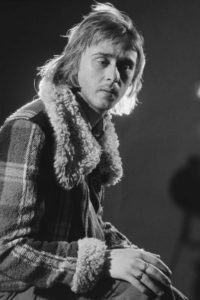 It has been announced today by the band, Fleetwood Mac of the death of former member, guitarist Danny Kirwan at the age of 68. Joining the band as a 17 year old in 1968, Kirwan soon became an integral part of the band, sharing lead guitar, singing and song writing duties with founder member, Peter Green, up till Kirwans departure in 1972. 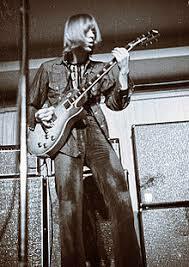 Making an immediate impact, Kirwan’s first contribution was to the enormous instrumental hit, Albatross, about which Peter Green claims couldn’t have been made without Danny. In 1969 Kirwan and Green split songwriting and lead guitar duties on the album ‘Then Play On’. This work became almost the template for bands featuring twin guitars as Green and Kirwan strove for a multi-layered orchestral effect from their Gibson Les Paul’s. Despite this relationship with Green, some of Kirwan’s best work came when he collaborated with third Mac guitarist, Jeremy Spencer and indeed when Green left the band in 1970, with Christine (Perfect) McVie joining adding organ to the mix, the band were able to continue with Kirwan and Spencer taking on songwriting duties. However this was only a brief respite from turbulence in the band as Spencer suddenly disappeared during a US tour (only to reappear in a religious cult commune) with eventually American Bob Welch joining the band to work with Kirwan. Their relationship, though with mutual professional respect, was fraught, made worse by Kirwan’s burgeoning alcoholism coupled with his deadly serious persona and striving for perfection. Things came to a head in 1972 with Kirwan’s eventual firing from the band being the end result. Through out the 1970’s Kirwan continued to work, though his debilitating issues meant that the three solo albums he recorded were not supported with any form of promotion or live tours, a contributory factor to their poor commercial performance. As the decade came to a close Kirwan’s mental health issues became worse resulting in a total removal from the world of music. Periods of homelessness and treatments followed through out the 1980’s and 90’s leading to Kirwan leading a reclusive existence, somewhat like his old friend and band mate, Peter Green. There was talk off reunions of the classic 5 member line up, but which came to nought as Kirwan showed little interest in joining up.